They don’t want us to park here, a small patch of pavement off North Albany Road near the East Thornton Lake Natural Area. Albany’s East Thornton Lake Natural Area may not get developed for at least a couple more years, but the city parks department has not forgotten about it. I learned this when I asked Parks and Recreation Director Ed Hodney to respond to what a reader wanted to know. The city of Albany bought the 27 acres of former farmland on the south side of East Thornton Lake in 2009 for $2.25 million. 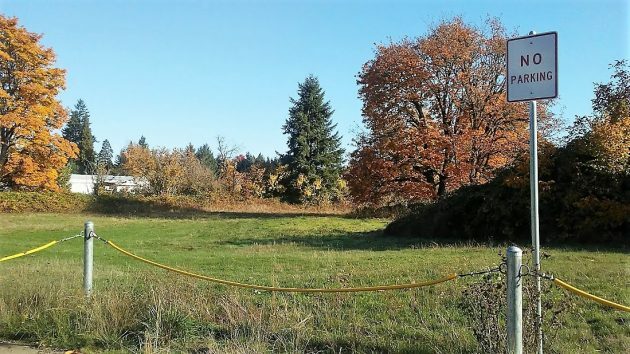 The purchase ended a land-use fight between developer Byron Hendricks of Salem, who wanted to subdivide the acreage for housing, and neighbors who opposed him. 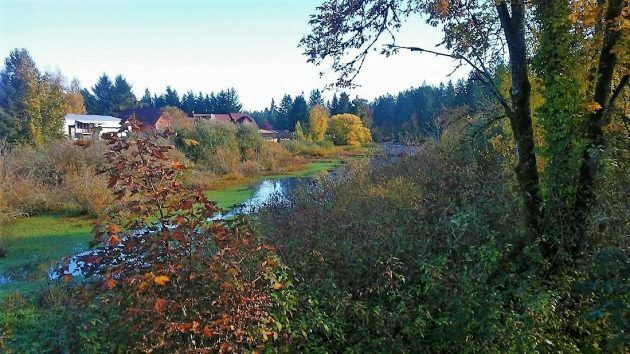 This past winter, students in the University of Oregon’s Sustainable Cities Year program designed a variety of concepts of how the property could be developed as a park. Then, construction of whatever is designed will be scheduled in the 2019-20 budget year. But this depends, Hodney hastened to add, on the success of any requests for grants and donations. It also depends on budget decisions by the city council. Looking east along East Thornton Lake. The natural area is on the right side of the lake. That was a great acquisition at the bottom of the market. It won’t be long before the value of that purchase will be more than the entire Pepsi settlement, it’s probably already half right now. Some very smart people involved in that. Albany may no longer be a small town but at least parks, like this, will preserve what once was. Maybe you can answer why that parklet or non-parklet is posted as no parking. Curious and non-accusatory….it seems to be used on occasion by a city employee, daring adventurer/kicker or random “car for sale by owner” person. My observations. Hoping you can share some info. If not, maybe The Answer Man. I did state “as a park,” which I definitely consider for “the greater good” of the community vs. just adding additional homes. Leaving it fallow would be waste of $$ IMHO. Correct me if I’m wrong. I often am. If I read the column correctly, the City purchased the land to end a dispute between a developer and existing landowners? What dog did the Citynhave in this fight? Developers and existing property owners have battled as long as there’s been empty, unused land sitting around. The question is, why did the City decide to spend $2.25 million? Seems to me that if the opposing landowners wanted to prevent development, they should have coughed-up the $2.25 million on their own. What was the City’s motivation? This was my heaven for a decade from 1958 to 1968 …. a pocket wilderness in my backyard on Greenacres Lane… The oxbow of the Willamette provided the most unique playground and classroom for my “free range” childhood …. I hope future children and all Albany residents can appreciate the “value” of this special place is beyond dollars; a refuge for birds, otters, beavers, and in my mind a refuge for human souls. When the existence of a “Friends of Thornton Lake” pressure group comes to light, it must be asked. Who are these “Friends,” and what, if any, undue political influence might the group have had in order to convince the Council that spending $2.25’million was a correct action by the City. After all, the property has essentially become a Private Reserve for those who live on the lake shore starting in 2009. With no parking available, very limited public access and no public development, the fortunate fewer-than-One-percent who dwell on the shores of Thornton Lake have been enjoying the tranquility of their taxpayer paid Nature Reserve, while the other 99% of Albanians have footed the tab sans the enjoyment opportunity. The whole affair reeks of special privilege. This City preference for the “Friends of Thornton Lake” has now gone on for 8-years, with no solid commitment from the City as to when regular folks will be able to walk the shores of that august body of water. Given this seemingly unending timeline, one can easily imagine that the “Friends” will proffer some environment-saving excuse to prevent any City Park from ever happening. Look at Thornton Lakeshore property values to see where this story will end. I understand your point John. The value of an issue is always enhanced when it abuts one’s own property. And it’s really easy to advocate spending other people’s money.